If you've ever watched a sitcom, you may have noticed that every show has a plot and a subplot. For example: Ricky and Fred think doing housework is much easier than earning money. Lucy and Ethel feel the opposite. So the boys try doing the housework while the girls attempt to hold down a job at a candy factory. Two things are going on here, yet they intertwine in a seamless way and in the end all gets resolved. 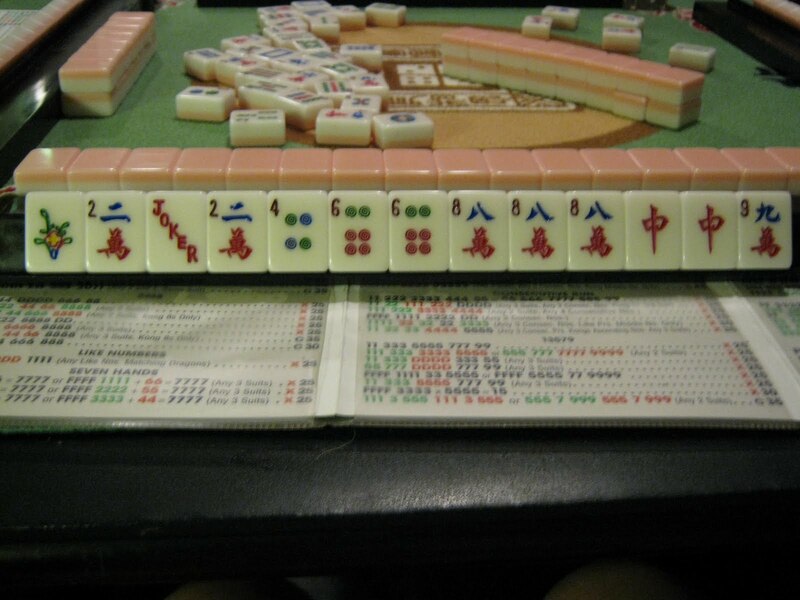 What does this have to do with mahjongg? Read on. My table mates rolled their eyes as I snapped pictures of my tiles, but they're familiar with my obsession and I appreciate their patience. The two hands above struck me with their similarity, making me realize I have a tendency to organize my hands into a plan A/plan B pattern. Both of these hands have 10 tiles for hand A and 9 tiles for hand B. The first hand: F 2J22 466 888 DD 9 was ripe for calling on the 2s or the 8s but required two pairs; the flowers and the 4 dots. Two four dots had already gone out and if another one fell, I'd be forced to switch to plan B - FFFF 2222 8888 DD, but I was ready. The second hand: 4 55J 666 777 999 was the same, yet different. I was in calling position for all possibilities here, no pairs to worry about. But there were two 4 bams out already. Had I picked a seven bam, I would have ditched the sixes and the four and gone with 555 777 7777 9999. Don't you just hate throwing out three of the same tiles in a row? But sometimes you must for the sake of the hand. No matter which plot thickened, I would have had to do just that. How did it get resolved? On the first hand, I called for the two crack and threw out the nine, but then someone else mahjed. Oh, well. On the second hand, I called for the five bams then had to face "decision time". I threw the nines, as I couldn't cover the seven bams, and when the final four bam came out I had the joker to cover it, so I mahjed on that hand. As with plots and subplots, the resolution of one should set up the resolution of the other. The time will come in the story of your hand when you pick a pivotal tile and you must decide which elements of plan B to merge into plan A (or vice versa) and what to discard. This may make you feel like Lucy in the chocolate factory but don't forget, in the subplot, Ricky and Fred make a mess of the kitchen by cooking four pounds of rice instead of four cups. In other words, no one said it would be easy, but hopefully your hand will have a happy ending. A few weeks ago, Amy wrote to me and asked for pointers on attending her first tournament. My advice was as follows: Relax and have fun! Most players come to a tournament for relaxed play and to meet others, not necessarily to win. Just pick and throw like you normally do, keep up the pace, avoid talking during the game and try not to give anyone mahj (but take a risk if you feel it's worth it). You might meet one or two tough older ladies, but a little respect will go a long way (flattery will get you everywhere). While you're building the wall take a little time to ask people where they're from and see if they're looking for fill in players. Maybe you can find a game. If anyone tries to rush you, just ignore them. The usual pace of a tournament is 4 games in 50 minutes, so just be mindful of the time. Playing too slow is probably the most egregious thing you can do in a tournament because if you time out everyone gets a zero. Most of the errors you will make nobody will even know about because they can't see your hand, but If you make an error that causes you to go dead, there's no need to be embarrassed because we've all done it at one time or another. Be your friendly and sociable self and play for pleasure. You never know, you might get lucky. Amy had a great time at the tournament and I suggested she write a guest post letting us all know how it went. Her account below will inspire people to go out and mingle. FYI, the names have been changed to protect the innocent. Thanks, Amy! Rhonda sported a beehive upsweep, and wore cat’s eye glasses on a gold chain around her neck. She squinted through them at me in response to my instantly regretted question about a hand on the 2011 card. This was my first ever tournament: The Cleveland Classic Mahj Tournament, presented by The Cleveland Jewish News. 84 women assembled on a sunny Sunday in a hotel conference room. A handful of us were in our mid to late 40’s, a good number were 50-somethings, and then a whole lot more were senior ladies. I’ve played for about 5 years and I love this game. We moved to Cleveland a year ago and I haven’t yet found a regular group. I’ve played so infrequently that I don’t know the 2011 card very well. So I happily signed up for this all-day tournament, with the blessing and support of my wonderful husband, who stayed home with our preschooler. The first hand was fast, very fast. Those ladies played at warp speed, and they picked ahead, even though it was expressly stated that this is not allowed. Before I could even rack my tile, the next player had hers in hand. I’m not at all slow but this was very irritating. Our first game was a wall game. Then, I won the second, third and fourth games. Yes, Rhonda, I know how to play. We played 6 rounds of four games, with an hour break for lunch, each round with a new group. The low point came in the second round, when my table included Edith. She was 95 pounds of competitive fury, with a small pinched face and the largest diamond earrings I’ve ever seen. She rushed us through the four games, fearful that we wouldn’t get them all played in the time allowed. She took it way too seriously and was rather unkind and brusque. I mean, I want to win every hand too, but it’s supposed to be a pleasant and social game. She got me so flustered that I threw the winning tile to another player’s hand. Edith scowled at me and said, “How could you give her that, couldn’t you see what she was doing?” No, actually, I was trying so hard to keep up with the blistering pace she set that I really had no idea what hand I was doing, let alone my tablemates. The other two players and I peeked at each other with sympathy and were glad when that round ended and we could move along to another table (with 10 minutes to spare!). I silently rejoiced that Edith won no hands, or rather, I would have if I were that kind of person. My proudest moment came just before lunch. 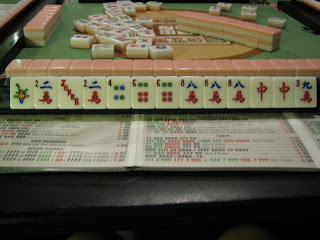 I won two hands, one of which was my first closed hand win ever – FF NNN EW SSS 2011. I picked my own winning tile and the hand was jokerless, so I scored 55 points. I took a picture of the hand with my cell phone to show my husband later. He kindly feigned an interest in it, pretended to listen to me babble on about it, and congratulated me on my cunning skill and good fortune. Sadly, the tiles went cold for me after lunch. I had just one more win, the last hand of the day, with one of the Lucky Sevens. But that’s okay. I had a fun day off, and held my own among players who have been playing for half a century or more. And, two very nice women asked me to play with their group as a fill-in later this week, so I guess you could say that I’m now part of the Cleveland Mah Jongg scene. Look out, Rhonda and Edith, because I’ll be back next year! Everyone gasped when Alex threw a 9 dot. After all, Bonnie had 7777 888 exposed. It was late in the game and only one 9 dot was on the table. There was only one hand she could be playing. Why did he take the risk? She could have been set! Inquiring minds want to know. An observant player would not be surprised by this move. Players will often unknowingly, and to their detriment, telegraph the status of their hand. Rigorous self-examination is required to rid yourself of the oft-fatal "tells". 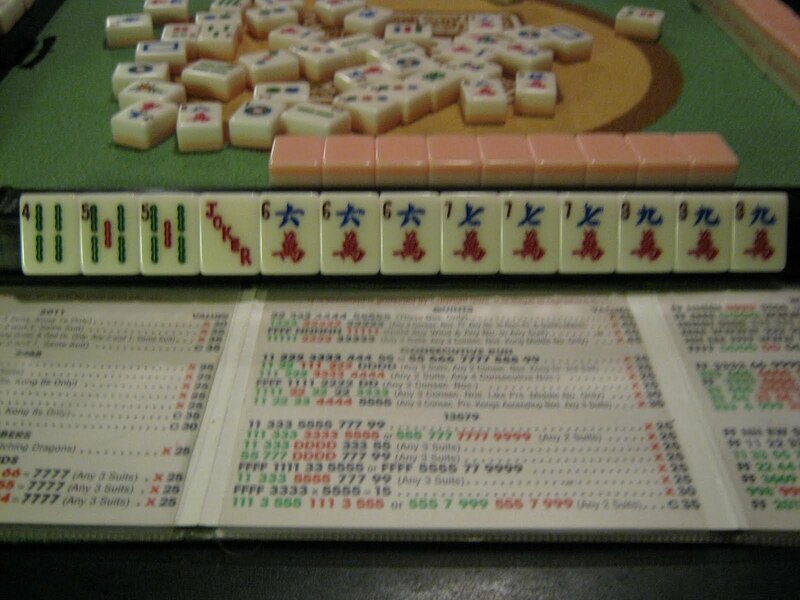 Do not expect other players to clue you in - remember, there are no friends in Mah Jongg! Read on and see if you recognize yourself. Do you: Separate your tiles so that everyone can see that you have two of this, three of that, one of this, three of this and one of this - and three on the side to discard? Do you: Keep your finger on the card near the hand you're playing? Do you: Play without thinking ahead so that you hesitate when a tile goes out? Do you: Moan and groan when your tiles get discarded or exposed by another player? Do you: Physically count how many you have for hand A and how many for hand B? Do you: Say "Oh crud!" or worse, when you pick a tile you know someone else needs - and then you keep it? Do you: Constantly arrange and rearrange your hand, letting everyone know that your hand is slipping away? Do you: Kvetch about how many jokers you could use right about now? All of these behaviors tell your opponents "Go ahead, throw my tile. I'm not even close!" Learning to control your reaction to surprising events will keep them guessing. When Hilda throws the 7th flower, and your chances of making a pair are gone forever, does everyone have to know? Does it help your game to slap your forehead and say, "Oh, no, I made a mistake!" Better to set out to remedy your mistake than ask for sympathy. While your opponents may say, "aw, boo-hoo, too bad," they are thinking, "well, she's no threat now. I can discard that 4 bam and move closer to mahj." Do you really want everyone to know that your hand is a mess? NO! 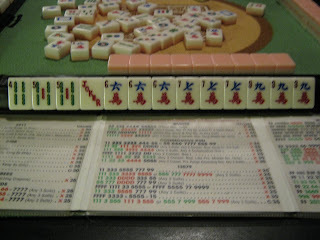 But - if you act as if you are one tile away from the greatest mahjongg hand on the face of the earth your opponents will act accordingly. How do you know when someone is set? Body language plays a big part. When I'm set, I lean forward, intent and ready to pounce the moment I hear the name of my winning tile. My heart beats more quickly and I am less patient with people. Let's go, I think, throw my tile already. But when I play in tournaments I try to curb my enthusiasm and become one of the quiet ones, emulating those players who silently go about the business of making a hand and seeing it through with control. No matter how weak their hand may be, they give nothing away, calmly focusing on the circumstances around them and weighing their odds. So how did Alex know that Bonnie wasn't set? He remembered earlier in the game she called for a six dot, then said, "No, wait, I can't" and let it go. As the play continued, he picked a six dot himself and held onto it, hoping to use it for joker bait. He also observed that when she did pick and keep a tile, it went on the right end of her wall, making it more likely to be a nine than a six. So he felt comfortable throwing what might have seemed to have been a hot tile. So a restrained attitude of watchful waiting, coupled with attention to little details will go a long way towards improving your game. If nothing else, remember this: You schmooze, you lose.